Yuri Bezmenov defected from Soviet Russia 40-plus years ago. A veteran of years of service in Moscow’s dreaded KGB, he eventually came to the West and then traveled through our country delivering his unique wake-up call. Members of The John Birch Society gathered most of his audiences. The warning he gave is needed even more today. The Ten Commandments as seen at the Herring family cemetery on Hollow Bridge Road near Autryville, NC (Flickr photo from Gerry Dincher, some rights reserved). There is much more that Bezmenov sought to explain to Americans. But his emphasis on the undermining of morality as the starting point in the campaign to destroy a nation deserves attention. Cleared of all its obfuscating wrappings, socialism is theft. Sad to say, many Americans have become captivated by its thievery in that they want a supposed free ride for things their parents worked for. And they want confiscation of wealth because they have been convinced that wealthy people are thieves. They know little or nothing about our nation’s foundations contained in the Declaration of Independence and Constitution. Nor do have any awareness of sound economic principles. Ask them about these fundamentals and expect to be told to cease referring to the “horse and buggy” days of the past. About morality, John Adams once stated, “Our Constitution was made only for a moral and religious people. It is wholly inadequate to the government of any other.” Government, in his view, should be a negative force, not a positive force for taking care of people who should take care of themselves. The people should guide their own conduct through such oldies as the Ten Commandments and the Golden Rule. And John Birch Society Founder Robert Welch frequently insisted: “Morality sees farther than intellect.” What good is there in the efforts of a very intelligent person, he explained, if that person has no moral base and uses his brilliance exclusively for self-aggrandizement? Yuri Bezmenov hoped there could be some kind of strong national effort to educate people about the real spirit of patriotism.” Along with that, he urged a parallel campaign to explain “the real danger of a socialist, communist, welfare state, Big Brother government.” And he saw in The John Birch Society the kind of institution that could reverse the already widespread demoralization throughout America – if it became large enough. His message, given decades ago, is still very much needed today. Learn what you can do to Choose Freedom — Support Morality at The John Birch Society’s action project page! Nationhood is good. World government is bad. Read about an early try at world government in Genesis and know that God Himself intervened to prevent it. Genesis further shows that God set people apart by inducing various languages which led to them starting nations. With a hard-won 52 to 48 majority, the people of Britain said that 53 years of membership in the pact was enough. Most had been persuaded that their country had signed a promising trade arrangement. It was certainly sold that way, not only o Britain, but to the other formerly independent nations who have joined. There was always some British skepticism about what they joined, a cautious attitude that kept their leaders from adopting the Euro currency. Even pro-EU Britons didn’t want to replace the pound with the Euro. Over in Brussels, EU leaders now worry about rising antipathy toward the pact in France, the Netherlands, Greece, Italy, Hungary, and elsewhere. A total of 28 nations had signed on to the arrangement that began a step-by-step and deceitful accumulation of power beginning in 1952 when only six nations formed the European Coal and Steel Community. This early arrangement later adopted the name European Economic Community. Britain joined in 1973, the year the pact dropped some of its pretenses by omitting the word “Economic” and subtly indicating its ultimate political goal with the new name, “Economic Community.” By 1991, six more nations joined and the group’s name became European Union. In a burst of honesty during his 2000 visit to Britain, former USSR dictator Mikhail Gorbachev glowingly described the EU as “the new European Soviet.” His remark created worries for many. Some in Britain began to fear losing their country while arrogant rule from Brussels took increasing control over lawmaking power. In 2003, Christopher Booker and Richard North issued their comprehensive book “The Great Deception,” capably tracing the lies given to the British people about the EU. Then, in 2004, this writer received a letter from an official of the UKIP stating, “The EU was sold to the British people as a ‘trading agreement’ and has turned into a ‘Political Union’ which is changing our laws and traditions.” That summed up the growing British awareness about what was happening. A few weeks before the June 23rd referendum, a meddling President Obama visited Britain to urge the people to choose staying in the pact. At one point, he angered many by stating that should the vote to leave the EU prevail, Britain would have to go to “the back of the queue” for any UK-US trade agreement. He is credited with helping the “Leave” proponents gain more votes. Back in 2003, the EU sought to impose a new Constitution on member nations. It openly and repeatedly stated overall subservience to the United Nations. When voters in France and Holland rejected this Constitution, the steps toward UN control showed up in a new “treaty” taking them toward a UN world government. This time, only the leaders of member nations were required to give their approval. World government under the UN has always been the goal of the EU’s creators. But barriers have now been erected on the sought-after prize. We salute the 52 percent of Britain’s voters and trust that they will now understand how enormous has been their contribution to the sovereignty of all nations. Is the US Capitulating to an Enemy Within? Former House member Michele Bachmann represented Minnesota’s 6th district during the years 2007-2015. Conservatives generally call her record “admirable.” But she declined to run for reelection in 2014 even while insisting that she would continue involvement in the political arena. New book “exposes a federal government capitulating to an enemy within and punishing those who reject its narrative” (WND image). During her last four years in office, she won appointment to the House Permanent Committee on Intelligence, the congressional panel assigned to delve into terrorism within our nation. In that work, she found herself frequently dismayed by testimony given by federal investigators. In comments recently provided to Art Moore of World Net Daily, she explained why she deplored what she and her colleagues heard from the government’s high-level sleuths. They don’t want problems to be exposed; they want to look good. Our job is to find out what the truth is, what’s going on in the area of intelligence. We deal with America’s classified secrets and, in particular, our focus was on terrorism. This is an extremely important job we have in Congress – to keep the American people safe. Bachmann realizes that the FBI had investigated Orlando killer Omar Mateen on three separate occasions before his killing spree. “He had all sorts of red flags, really blaring billboards, about what his intentions were. And we couldn’t stop him.” After newer discussions with Haney, she pointed to his belief that a connection existed between the Orlando massacre and the similar carnage carried out in San Bernardino in December 2015. She wonders if Mateen might have been constrained before he killed 49 people. Haney has appeared as a guest on numerous television interview programs. Always agreeing that the vast majority of Muslims in America pose no threat, he nevertheless insists that some of Islam’s followers are indeed dangerous, and our own government has refused to admit this and take appropriate action. Bachmann sought the GOP nomination for President in 2012. Dropping out early, she became the target of the House Ethics Committee and the Federal Elections Commission over alleged campaign violations. When she announced her intention to leave Congress, those investigations were cancelled. Credit Bachmann for helping to bring Philip Haney’s story to the American people. And credit Haney for his whistleblowing efforts. Millions should read his book. All segments of the mass media, not to mention politicians, clergy, and entertainers, went overboard to heap praise on the late Muhammad Ali. Few offered anything about his many dishonorable stances and statements. Malcolm X photographs Muhammad Ali after his defeat of Sonny Liston. (Photo by EPHouston (Own work) [CC BY-SA 4.0], via Wikimedia Commons). Yes, he was a champion in the ring. Yes, he showed a humorous side, especially when he knocked pretenders off their self-created pedestals. And yes, he exhibited admirable courage when Parkinson’s disease ravaged his body. TIME Magazine devoted 24 pages plus the cover of its weekly outpouring of political correctness to laud the late boxing legend. Full-page photos of Ali consumed eight of those pages with smaller complimentary photos throughout the remaining 16. And even though TIME’s writer Robert Lipsyte capably informed readers about the rise and fall of much of the man’s career, he left out the darker side of the famous pugilist’s life. Sports Illustrated used 20 of its pages to do likewise. Standing virtually alone, in dealing with the topic, Boston Globe columnist Jeff Jacoby acknowledged Ali’s athletic prowess but he recoiled at the praises given the man for his “civil rights” dedication. Jacoby pointed to flattering comments uttered by NBA Commissioner Adam Silver, British Prime Minister David Cameron, Massachusetts Senator Elizabeth Warren, and others. Many more heaped similar but undeserved praise on Ali while skipping his downside. Early in his career, then-Cassius Clay fell under the influence of Malcolm X, the dangerous racist who founded the Black Muslims. He quickly renounced the name given him by parents, calling it his “slave name.” Adopting the name Muhammad Ali, he was interviewed in 1968 by Boston Globe columnist Bud Collins who quoted the emerging heavyweight boxing king as follows: “I know whites and blacks cannot get along; this is nature.” Then he began associating with Nation of Islam leader Elijah Muhammad. He even appeared at a Ku Klux Klan rally where a hooded throng burned a cross. In his TIME article, Lipsyte included the contrary opinion of Floyd Patterson, one of Ali’s opponents and himself a black American. Considered a crusader for Christianity and America, Patterson offered, “The image of a Black Muslim as a world heavyweight champion disgraces the sport and the nation. Cassius Clay must be beaten and the Black Muslim scourge must be removed from boxing.” Ali was outraged that Patterson had referred to him by his “slave name.” Then he pummeled Patterson in the ring. At an age when he was eligible for military service, he was initially deemed unqualified because of not meeting educational standards. Once those qualifications were lowered, he did become eligible but his stern refusal to serve in the military ended up with him in the courts. He was tried and convicted by a jury and sent to prison for several years. Answering questioners, he said, “I ain’t got nothing against them Viet Cong.” Had his determination to stay out of uniform been based on legitimate criticism of the way the war was being conducted, his protest would have made some sense. Never apologizing for his racism and unwillingness to serve in uniform, and wracked by Parkinson’s disease as he grew older, Ali won nationwide sympathy for decades. But his medical problems grew worse and he passed away on June 10, 2016, at 74 years of age. Which Way Goes the Supreme Court? Perhaps the most important issue for America’s voters in 2016 is the future staffing of the United States Supreme Court. There are long lists of other matters to be considered by whoever becomes the next President and which party dominates both houses of Congress. But whoever gets tapped for the Court and survives the Senate confirmation hearings will, because a place on the Court is a lifetime appointment, be in a position to shape much of what happens for decades. Would the Constitution survive more leftist Supreme Court appointments like Justice Ruth Bader Ginsburg? She appears above at Northwestern Law. (Image from a video from Northwestern News Vimeo page). Currently, the Court is divided 4 to 4. Half of the eight justices are solid liberals and the other half lean toward conservative values. Since the death of Antonin Scalia, there have already been 4 to 4 rulings, a standoff that temporarily leaves the matter in favor of the previous ruling rendered by a lower court. If there is no previous ruling, the matter at hand will likely be brought before the Court after the vacancy is filled. The current liberal-leaning justices include Ruth Bader Ginsburg, Stephen Breyer, Sonia Sotomayor, and Elena Kagan. Those of a more conservative bent are Chief Justice John Roberts, Anthony Kennedy, Clarence Thomas, and Samuel Alito. The age of several justices makes it virtually certain that filling the seat formerly held by Justice Scalia will not be the only vacancy to be filled. Among the liberals, Justice Ginsburg has lasted much longer on the court than most expected – possibly even herself. At 83 and with a history of pancreatic cancer which she seems to have survived quite well, she almost surely will opt to retire soon. Stephen Breyer is 77 years old and might also retire. Sonia Sotomayor (57 years old) and Elena Kagan (51 years old) can be expected to hold their places for many more years. On the conservative side, 79-year-old Anthony Kennedy leads in age and it would surprise few if he soon decides to step away. When there were nine justices, Antonin Scalia could regularly be found in the conservative camp and Anthony Kennedy frequently held what has been called the swing vote. The other conservative-leaning justices, each more solid than Kennedy, are John Roberts (age 61), Clarence Thomas (age 68) and Samuel Alito (age 61). None of these three are expected to retire anytime soon. There is little doubt about the choices Hillary Clinton would make if she becomes the nation’s 45th President. She would choose liberals. Should Donald Trump become the nation’s chief executive, his choices for places on the Supreme Court would likely lean conservative though that lean would not be not as pronounced as would be the liberals Clinton would nominate. America’s Founders expected the Supreme Court to be the least powerful of the three branches of government. But their attitude has largely been cast aside because the Court now makes law. Because such great power resides in the judgments of the nine seated at the Court, America’s voters should hardly overlook what the future makeup of the Supreme Court will be when they pull a lever or ink a ballot in November. Headlines and electronic media have been full of the gory details surrounding the horrendous crime in Orlando. At least 50 are dead (one being the killer) and more are wounded. But many reporters and commentators have claimed that the rampage was a “senseless” crime. That assessment is itself senseless. 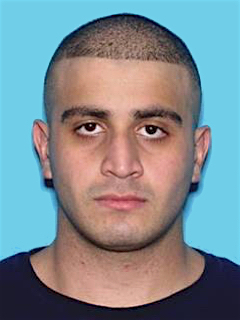 Omar Mateen (Photo by Florida Department of Highway Safety and Motor Vehicles (Omar Mateen: 5 Fast Facts You Need to Know) [Public domain], via Wikimedia Commons). Omar Mateen, an American citizen, was born in New York City into a Muslim family. In 2006, he earned an associate degree in criminal justice technology. After a few years of bouncing from one job to another, he found steady employment as a security guard. In 2009, he got married and bought a home. But the marriage ended in divorce after, according to his wife, he had abused her. By 2013, co-workers reported suspicions that he possessed ties to terrorism. The FBI investigated him twice but found no reason to act on the worries of the co-workers. In an interview with ABC News, his ex-wife and his father claim that he was not radicalized, yet when the ex-wife was interviewed by federal authorities, she said he was radicalized within the last year. During his deadly rampage, Mateen shouted “Allahu Akbar,” a phrase regularly used by Muslims at the start of prayers and other occasions. Among several meanings, the most popular is “God (or Allah) is great!” He called 911 during the shooting and stated allegiance to ISIS, a revealing fact confirmed by California Congressman Adam Schiff, the ranking Democrat on the House Intelligence Committee. What motivated this man to kill so many others? Why did he commit his crime when he certainly could expect to be gunned down himself? President Obama termed Mateen’s horrific deed “an act of terror and an act of hate.” But he carefully avoided what else the crime was – the act of a radical Islamic terrorist. Marine Corps University instructor Sebastian Gorka said it amounted to “individual jihad.” Security Policy Analyst Clare Lopez said Mateen’s crime was not the act of a “lone wolf,” but that of a deliberate individual concretely carrying out his obligations of Sharia. The article states another young man who occasionally visited the mosque became America’s first suicide bomber in Syria in 2014. FoxNews.com has reported extensively on Robertson, a former U.S. Marine who served as a bodyguard to the Blind Sheik involved in the 1993 World Trade Center Attack and led a gang of New York bank robbers called “Ali Baba and the 40 Thieves” before resurfacing in Orlando, where he started an Islamic seminary. Robertson is reportedly being questioned by federal authorities. Vast numbers of Muslims want to be left alone to raise their families and live in peace. They do not become jihadists. But even if a minuscule amount of the world’s 1.6 billion Muslims become radicalized, the non-Muslim world must be on guard. Omar Mateen’s rampage wasn’t “senseless.” Nor could the murders and mayhem committed by the San Bernardino pair, the Boston bombers, the Fort Hood killer, and so many other criminals be deemed “senseless.” These were deliberate deeds carried out by deliberate individuals. It is senseless, and potentially even suicidal, to conclude otherwise. Editor’s Note: Keep up with The New American’s coverage of this as a more comprehensive profile takes shape of who exactly was Omar Mateen, from an alleged homosexual to a security guard working as a Department of Homeland Security contractor.